Hey friends! I’m continuing my partnership with Carnival this year, and now that the weather is (finally) awesome and warmer here in DC, I thought it would be fun to share a Caribbean recipe inspired by our cruise back in December/January. 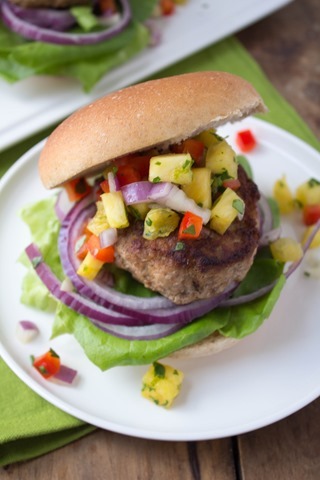 Introducing: Jamaican Jerk Turkey Burgers with Pineapple Salsa! 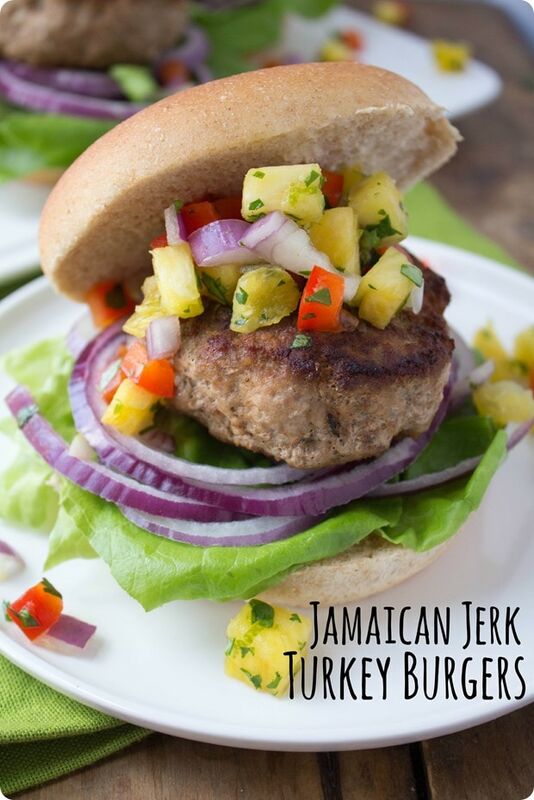 I’ve always loved Caribbean-inspired food – it’s so fresh and flavorful – and Jamaican jerk seasoning is one of my absolute favorite flavors in recipes. Carnival actually served a delicious Jamaican jerk chicken while on our cruise which reminded me how much I love it! Jerk is a style of cooking in which meat is dry-rubbed, marinated, or seasoned with a mixture called Jamaican jerk spice. The seasoning is often applied to chicken, but it goes well with most proteins, including vegetarian protein like tofu! Jerk seasoning traditionally includes two main seasonings: allspice and Scotch bonnet peppers, which are also known as Caribbean red peppers – they are a variety of chili pepper native to the Caribbean islands. The seasoning also usually contains cloves, cinnamon, onion powder, nutmeg, thyme, garlic, and salt, but recipes vary. You can either make your own jerk seasoning (here’s a Jamaican jerk seasoning recipe) or simply buy it pre-made – most grocery stores sell it. Between the jerk spice flavor and the summery pineapple salsa in this recipe I can almost feel the sand between my toes and the gentle swaying of the ship again. Take me backkkkkk! This makes a great weeknight meal, especially if eaten al fresco. Pair it with some veggies or salad if you’d like to add a little more oomph – baked sweet potato fries would be great with it, too! You can grill or pan cook the burgers – either way, I recommend cooking them in coconut oil to amp up the island flavor even more. 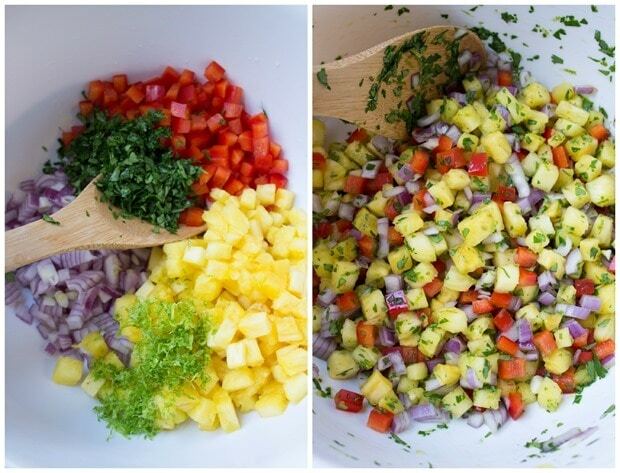 The pineapple salsa makes this dish – don’t leave it out! I recommend making extra and repurposing it into another meal later. It would be really good mixed with brown rice, avocado, and black beans and served atop salad greens for an easy vegan lunch! Here’s the full recipe. Happy eating! For serving: whole wheat buns, sliced red onion, lettuce, etc. 1. In a bowl, stir together the pineapple, bell pepper, red onion, lime zest and juice, and cilantro. Season to taste with salt and pepper, then set aside. 2. Combine the ground turkey and jerk seasoning, mixing just until combined. Be careful not to overmix, or the meat can become tough. Divide the turkey into four portions and shape into disks. Season with salt and pepper. 3. To cook the burgers on a grill, lay a sheet of aluminum foil greased with coconut oil over the grill grates in case the burgers crumble a little. Place the burgers onto the foil and cook over high heat until golden brown on one side. Flip the burgers, cook until browned on the other side. Reduce heat to medium and close the grill cover, cooking until the meat is fully cooked through and no longer pink. 4. 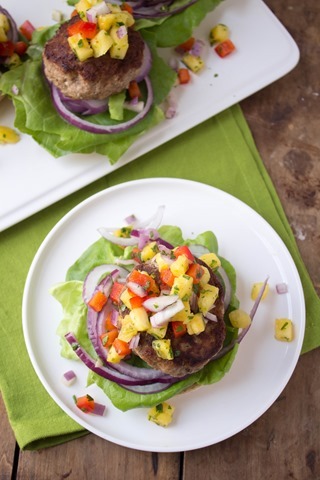 To cook the burgers in a pan, heat a thin layer of coconut oil in a large skillet over high heat. Add the burgers and cook until golden brown on one side. 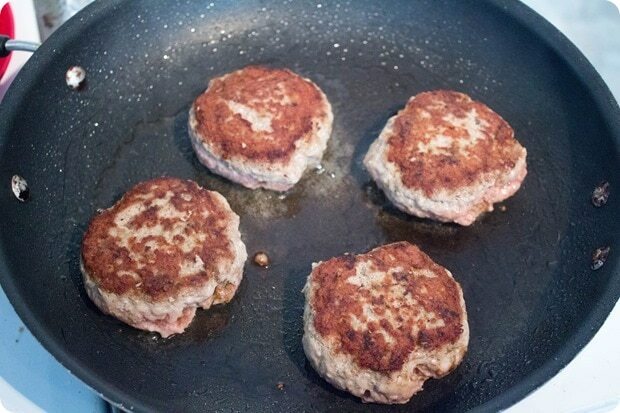 Flip the burgers, cook until browned on the other side. Reduce the heat to medium, cover the pan, and cook 5-6 more minutes, until the meat is fully cooked through and no longer pink. 5. 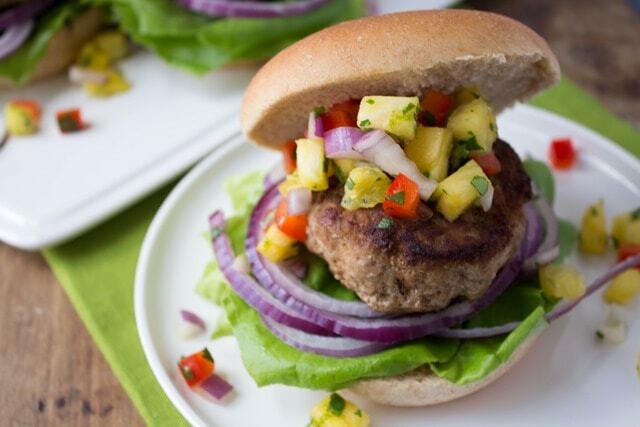 Serve burgers with the salsa, on buns if desired. Enjoy! p.s. If you like this recipe, check out my Caribbean Shrimp Quinoa Salad recipe too! This post was created for Away We Go with Carnival, the destination for getting in the getaway state of mind. Head on over! Next article: Week in Review + Colorado Bound! This looks so yummy! Thanks for sharing!! 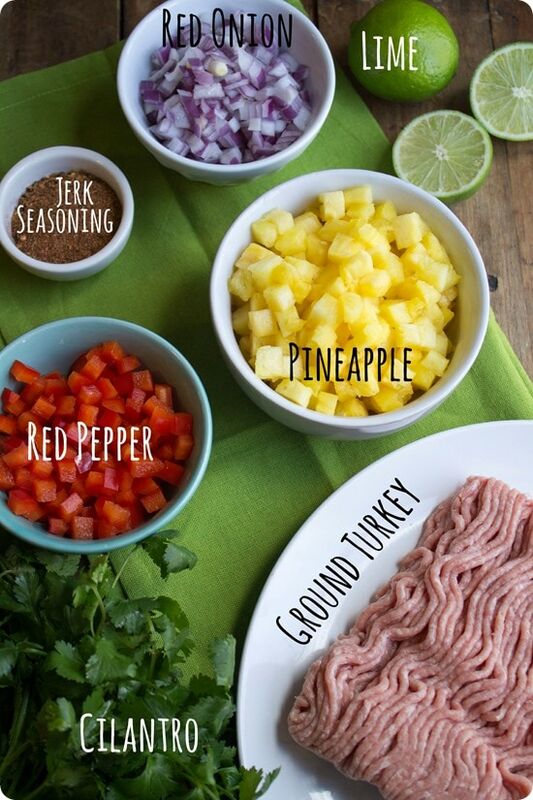 I love turkey and pineapple! I so enjoy Caribbean inspired food! I could make it at home, but always make a beeline for the grilled pineapple at the Whole Foods salad bar. So good! This looks very good, Anne, thanks. But, are turkey burgers as tasty as beef burgers?